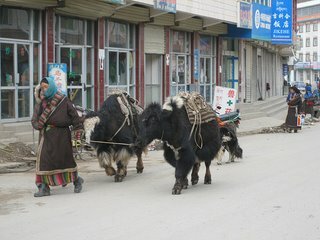 We were in Xiahe and Langmusi, tiny towns/villages in the southwest corner of Gansu province. It was a fantastic break from the city tour we had been doing and went a long way towards refreshing our travel energies. We were near enough to the mountains of the Sichuan province to pretend we were in the Alps or Rockies (as well as to get to try out ALL our winter gear, such as it was). We'd love to return someday in the summer time though to see the grasslands in all their glory. These towns were both high (almost 10,000 feet) and we really felt it trying to breathe, especially climbing stairs. The altitude made is quite COLD and it was very evident that we were a little early for tourist season. Though that led to some discomfort (and many things being closed) it was wonderful to see both places as the only westerners in town. Xiahe is a long thin town and home of the Labrang monastery, the most important Tibetan monastery outside of Tibet. The monastery once held 4000 monks but was devastated during the Cultural Revolution. It is back up to 1,200 monks and had a bustling liveliness about it. The monastery is surrounded by a 3 km path of Tibetan prayer wheels (a very popular destination for the various Tibetan Buddhist pilgrims) and also serves to divide Xiahe into the Chinese Han/Hui half and the Tibetan half. Langmusi was much smaller, just a short main street with a couple of neighborhoods building off of it and two monasteries across the river from each other. This had a similar feel to some of our visits in Laos; pigs roaming the streets, a lot dirty in places, etc. However it also had the same friendly feel that those places did. While not quite as modern as Xiahe was it had tons of charm and a beautiful background. -- One of the best parts of this trip for us was being surrounded by a riot of colors and a large diversity of clothing and ethnicities. After the homogeneity of more mainstream China, this was a nice change and felt really exotic. The Tibetan clothing was very colorful (especially the women's) and incredibly distinctive. I really wanted to buy one of the huge coats that they wore like coats or cloaks, but finally decided that a) getting it home would be an issue and b) I wouldn't really have anywhere to wear it. -- We were really struck by the friendliness of the people. Like anywhere in the world, when you get out of cities into smaller towns you have more of a chance to connect with people. In addition, we found the Tibetans in particular to be very friendly open, and curious. -- In Xiahe we stayed at the Tara Guesthouse, a cute family run place just next to the monastery complex. The rooms were basic, but charming and the family was incredibly helpful. Unfortunately, though the rooms had character, they had no heat. We did have a stove in ours, but we didn't feel comfortable using it as at worst we were afraid of carbon monoxide (think Admiral Byrd) and at best we didn't need to be breathing any more coal smoke than already consumed on the trip. -- When we checked into the guesthouse in Xiahe, we were informed that there was hot water for showers from 8-10 at night. We appreciated the info, but it was cold enough that we didn't feel under a compulsion to take a shower. However when the owner found us the second night to tell us the water had been heated up, he seemed so disappointed that we weren't going to shower (maybe they heated it up just for us?) that we promised him we would take one the next night. Well, that next evening came even more frigid than the former and we cursed our big mouths. -- We also set a new personal record on this swing by each wearing the EXACT same outfit everyday, both day AND night. Yes, it was cold enough that we were sleeping in socks, pants, fleeces and stocking caps. -- One of our favorite moments in Xiahe occurred when we met a young monk, (a student at the prestigious philosophy college, the biggest of the monastery's 6 colleges) started a conversation with us and then invited us back into his dorm room. The students live seven to a room, each with a bed and bookcase of their own. The rooms are basic, but comfortable, and the monks have put up posters (mostly religious, but this dorm included small pics of Shaq and Jordan) to decorate. It was really cool to talk to him and find out more about the lives of these young monks. -- Our primary eating establishment in Xiahe was the Nomad Cafe (our other sojourns having all ended in failure). This third floor restaurant was the local hangout of choice and by mid-afternoon, the window tables were packed with monks and Tibetan pilgrims drinking tea and looking down on the comings and goings below. -- Speaking of yak butter, it featured prominently at the monastery as well. The candles burning in honor at each of the temples are made of yak butter and give off a very strong and distinctive odor. I don't know that Crate and Barrel will be featuring them any time soon. More spectacularly, however, were the yak butter sculptures created for the recent New Years festivities. Now Brian and I consider ourselves to be relative butter sculpture connoisseurs being veterans of several trips to the Minnesota State Fair's dairy building with its butter carvings of the dairy princesses. However those are like finger paintings compared to Michaelangelo. These yak butter sculptures were intricately and delicately carved with unbelievably vibrant colors (though still that distinctive odor.....). Very cool. -- Langmusi was a wonderful place for us to visit and lived up to all our expectations and hopes in all ways except one (see below). It was nestled up against snow dusted mountains on one side, high grassland hills on another, and a red butte you'd swear was in Arizona on the third side. Really incredibly picturesque. After 3 weeks in big cities and fighting with pollution, etc. It was just fantastic for the two of us to get to spend a few days hiking around out in the hills and mountains and forests and streams. Very healing for the soul. -- We really liked the Chinese train system, despite the occasional horror story in hard sleeper. (That is, as long as we were able to avoid hard seat overnight journeys). Otherwise it has been convenient and (especially in the case of the soft sleeper) comfortable. The buses, on the other hand, have been a little bit more of a challenge. In Laos the buses were very old with large holes and more people and livestock than you know what to do with. In China it hasn't so much been that the buses are rickety, but just that we have been stuffed in with more people than you think can fit, two-thirds of whom are chain smoking unfiltered Chinese cigarettes. That can make for some very long bus-rides, especially over windy, bumpy roads. Off to the Yunnan province! Before you left on your trip, you guys planned this out, right? Brian: "Hey, on our next trip let's go somewhere that's freezing, way up in the mountains in frickin' China so it's hard to breathe." Becca: "Yeah, then let's hang around lots of smokers that burn coal for heat. And I'd like to stay in an unheated hotel, if at all possible." Brian: "Better yet,let's stop showering so we can smell like the locals." Becca: "Sure! And I've always wanted to learn to squat over pit toilets so putrid I get physically ill."
Brian: "Since this will be such a romantic trip, how about we sleep fully clothed"
Becca: "Yeah, that will keep me from getting pregnant so I can make sure Lincoln was wrong." Brian: "Hey, that gives me an idea for a great April Fools joke. Anyway, I've always felt like wearing clean clothes was overrated, so let's just wear the same thing every day." Becca: "Sure, honey, sounds like fun. Will there be Yak butter involved?" Brian: "Everywhere you look. To eat, to drink, even to sculpt." Becca: "When do we leave?"